A student team representing the Master of Science in Business Analytics (MSBA) program at the Wake Forest University School of Business took first place in the 2019 Wake Forest University Graduate Business Analytics Competition. Seven colleges across the country participated in the data-driven challenge, which culminated in a final round at the 2019 Inmar Analytics Forum March 27. Using data analytics, the student teams were challenged to solve a supply chain optimization problem for a fictional running shoe company. The teams received cost data, shipping costs, forecasted demand, and other variables to evaluate. Drawing insights from the data, the students redesigned the company’s supply chain operations while considering the trade-off between cost efficiency and customer service. Student teams representing business analytics and similar master’s degree programs from the College of William and Mary; Duke University; the University of Cincinnati; the University of Denver; the University of Tennessee, Knoxville; Virginia Tech, and Wake Forest University competed in the two-day competition held March 26-27. The teams were judged on the quality of methods, solution, and presentation. The first-place team of Max Davis, Stephanie Delaney, Andrew Bowers, Mathias Talbert, and Forest Richardson, all Wake Forest MSBA students, received a $12,000 cash prize funded by Inmar. Forest Richardson (BS ’18, MSBA ’19) credited the MSBA program’s blend of business acumen and data-driven classes as important factors in helping the Wake Forest team succeed in the competition. “I feel really proud knowing that our hard work paid off and that we get to share something really awesome with each other. We encouraged each other through it,” she added. A five-member team from Duke University placed second in the competition and received $8,000. The University of Denver’s team placed third, earning its four members $5,000. Two panels of judges determined the three finalists and winners. A semifinal round held March 26 at the Wake Forest University School of Business narrowed the field from seven competitors to three. The semifinal judges included: Oz Tuzcu, senior director of analytics and insights from VF Corporation; David Evans, vice president of pricing strategy at Inmar; and Ben Martin, chief officer, advanced analytics and global planning at Hanesbrands, Inc.
A panel of judges representing executives from Inmar chose the first, second, and third place winners in the final round. The panel included Rob Zomok, executive vice president of global operations; Rob Small, senior solutions expert, supply chain analytics; Curtis Greve, vice president of remarketing; and Jeff Clouse, director of data science. 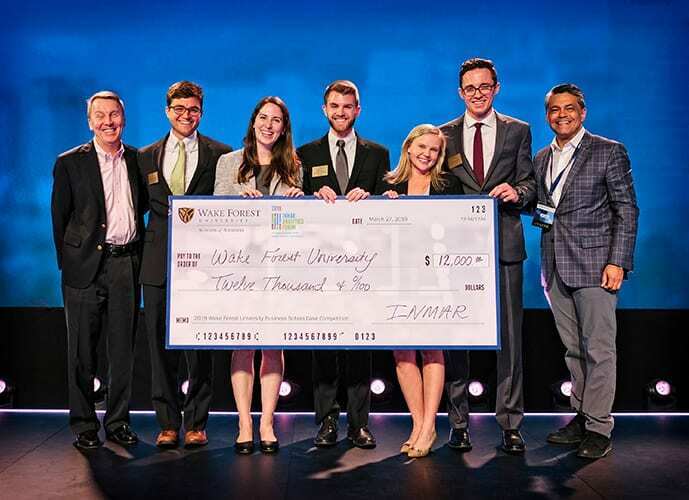 The 2019 Wake Forest University Graduate Business Analytics Competition was presented by the Wake Forest School of Business and sponsored by Inmar. In the 10-month MSBA program at Wake Forest, students from diverse undergraduate majors gain technical skills across a full spectrum of analytics methodologies and develop business skills through innovative courses such as Analytics in the Boardroom, Analytics in Society, and Data Visualization.